During my trip across America, I was visited in neighbouring city of Toronto, Missisauga, company Neetronics and talked with his owner Paulo Neethiling. He showed me all 300 hp jewellery, which hid big telescopic door in rear sections of their building. I am find out company Neetronics was institut in year 1995 and it was opened and finished another companies nomine NHR (ya, guys probably haven´t time for hang down logo on the building :-)). As Neetronics to create around five employees interested in mechanical and mainly electrical modifications of engine. So in year 2001 they found the right garage and they bought dyno for all-wheel drive, because thay often play with Subaru Impreza. Now they have everýthing that they need and they now offer peak modifications of engine management unit, do quality diagnostic and find also the smallest problem. They also presented fabrication of their products for e.g. fuel pumps, fuel jets, DCCD controllers... and installation which is qualitative and isn´t usual, but then the cars end up with blown engine. Cars, which they usually prepare, are budgeted for track racing alternatively is concerned „streetcars", well they build too cars for drag racing a last three years also for drift racing. I'd like to write a couple of lines about cars, in which guys from company Neetronics work meanwhile my visit. It has been usually professional Japanese street cars or from drift or track racing scenes. Look like I am remember, them power is drowe round 300 hp. Myself, I best capture NISSAN S13, drift car, which implant engine SR20DET, which pulls on wheels strength around 350 hp! Accordingly I was surprised by Honda Civic, which output myself estimate around 300 hp and is preparing for 400 hp! 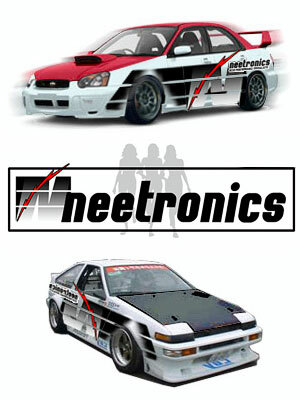 Paul (owner of Neetronics) also own old Toyota Corolla, famous from drift scene, with 220 hp, those power unfortunately don´t accept axles and meanwhile my visit was she stationary. At last I would thank´s to Paul for willingness and for me lost time meanwhile my visit. Do you want to have your company profile published on Tuningmag.net, too? Please, contact us!